In case you were skeptical about Russell Westbrook’s MVP bona fides, consider tonight’s one-man destruction of the Orlando Magic. Russ went for 57 points, 13 rebounds, and 11 assists, notching the most points in a triple-double in the history of the NBA. OKC was behind for most of the second half, trailing by 21 in the third quarter, and eventually finding themselves down 14 halfway through the fourth. That’s when Westbrook came alive, scoring 15 over the rest of the period and nailing the game-tying three-pointer that sent things to overtime. Every single person in the arena knew he was going to take this shot; he still buried it. The comeback is the largest in Thunder franchise history, and it clinched them a playoff spot. Yes, it was against the Magic; yes, Russ took 40 shots; and yes, he got to 57 with the help of overtime. Those caveats are worth noting, but they should not detract from Westbrook’s 38th and best triple-double of the season. The Thunder’s roster is stocked with ineffective shooters and one-dimensional players. Don’t ding Westbrook for putting the Thunder on his back and destroying the Magic alone. 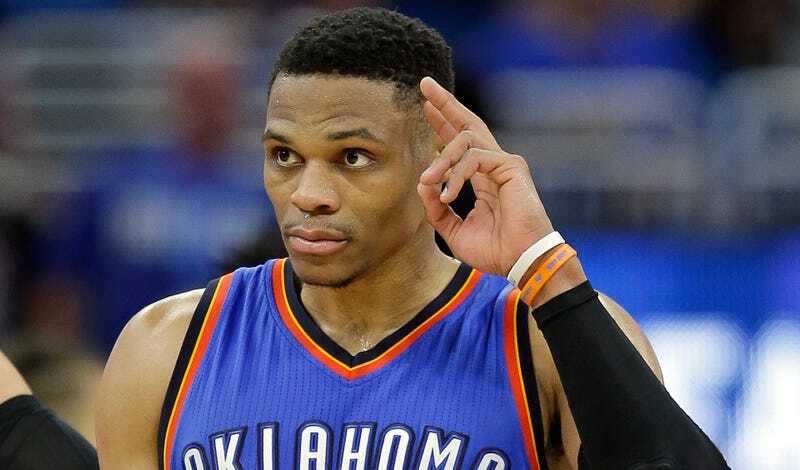 His volume numbers are gaudy, yet the best way for the Thunder to play is by letting Russ go hogwild and shoot to his heart’s content. Enjoy a late-game highlight reel. Even Magic fans kissed the ring, serenading Russ with MVP chants. Westbrook needs an additional 39 rebounds and 51 assists to lock up a triple-double average, which will probably take him four or five games. He doesn’t need to score another point, obviously, since he’s averaging an NBA-best 31.4 points per game.